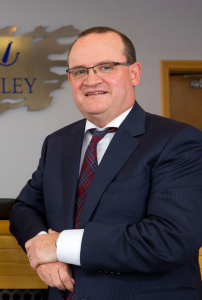 Sam McCauley, CEO, Tony McEntee says that Waterford could languish without a university. LAST September, Sam McCauley announced that they were closing their high profile city centre premises for good with the devastating loss of 27 jobs. The company had been trading, seemingly well, on Broad Street since 2001 and the announcement came as a shock to the whole city. It was followed by the closure of Mothercare, rumours of other premises closing, and the continued delays to the opening of premises like T&H Doolan’s, Wetherspoon and the commencement of the North Quays Development, which had been proposed to start in early 2018. In an effort to understand why Sam McCauley’s chose to close their Waterford store, while at the same time announcing the opening of a new outlet in New Ross, the Waterford News & Star contacted their CEO, Tony McEntee with a number of questions, the first of which was why they decided to leave in the first place. Speaking about the challenges that are facing Waterford right now, Mr McEntee said that most of the issues are the same ones that are facing other parts of the country too. As part of an exit interview – of sorts – we asked Mr McEntee what he thought could be done to turn around Waterford’s fortunes. The CEO pointed to Waterford’s Achilles Heel, and the one area that unless it’s sorted, “could leave the city lagging for many years to come”. He added that Waterford needs to “focus on growth areas” and become “industry specific”. Mr McEntee concluded by saying that there is “massive potential” in Waterford, but the pharmacy chain had “no plans to return to the city centre in the medium to long term future”.